The snow is melting, the sky is filled with sunlight… It’s springtime! Hurray! But for some pool owners, spring often means headaches, whether because of a broken liner, broken frame, cracks, sunken ground, or groundwater flooding. 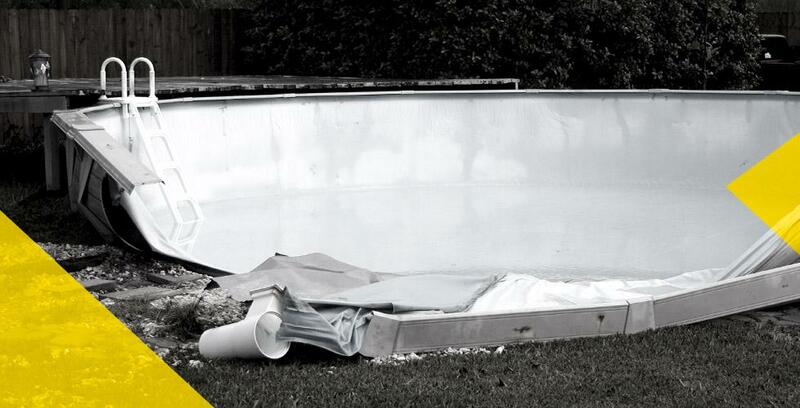 What should you do if a pool disaster strikes? And how can you prevent one from happening? Let’s walk through the different scenarios together. If you have a broken water pump, water heater, or filter, avoid handling the parts. Otherwise, you might end up making it worse. Don’t get into the pool either—the liner is fragile during the spring thaw and could break. The best thing to do is to call a well-established pool repair company with a solid reputation. Make sure the company has liability insurance to cover any at‑fault damage. During the summer, check to see if water is gathering around the pool. If it is, correct the slope of your yard to redirect the water as far away as possible. Basically, the ground under your pool should always be dry. Closing your pool is also an essential step. Be sure to follow the manufacturer’s instructions. Another habit you’ll want to get into checking for liner wear. In case of doubt, call in a professional for help. If the liner gets too worn, the friction as it rubs against the ice and extreme temperature variations in the spring could end up breaking it. If you have an in‑ground pool, check for cracks in the cement. Water that seeps into cracks can cause damage when it freezes. With most insurers, including Promutuel Insurance, coverage for pools, hot tubs, and pool and hot tub equipment isn’t automatically included in your home insurance policy. If your pool breaks, you’re covered if your property sustains water damage and you have third party liability for inadvertent damages to a third party. But damage to the pool itself isn’t covered. For that, you’ll need to add a pool endorsement to your policy. As regards in‑ground pools, some insurers consider them as part of the building and cover them in your home insurance policy. With others, you’ll need an endorsement. So that’s something you’ll want to confirm when you request a quote for home insurance. And with that, happy pool season!